We deal in Laboratory Pipettes mainly used in biology, chemistry and medicine for pouring a measured volume of chemical or solution. Our Chemical Droppers are available in various sizes and shapes. Custom-Made Laboratory Pipettes can also be purchased from us. 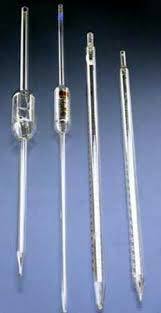 We are widely acclaimed as Manufacturer, Exporter and Supplier of Laboratory Pipettes from Pondicherry, India. The reason behind our prominence is best quality at relatively low price. Working : Many pipette types work by creating a partial vacuum above the liquid-holding chamber and selectively releasing this vacuum to draw up and dispense liquid.